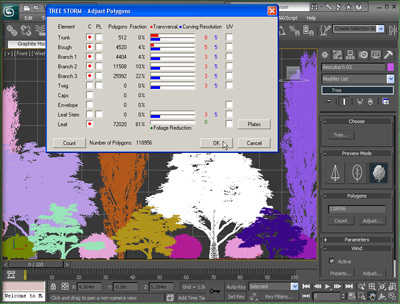 Variabile modeling resolution and detailBesides extremely fast modeling, TREE STORM enables you to choose the detail and resolution of a tree prior to actual modeling. Also, once the tree is modeled in the scene, it takes just a moment to go back, adjust the detail and resolution of the tree, and remodel it again. You can even change this tree by adjusting its random seed, or replace it with another tree from the library. Once a tree has been positioned on the scene, you can change it by adjusting its random seed. Or, you can enable random variation in TREE STORM Parameters rolout prior to actual modeling and then proceed with the positioning. Just start by clicking the mouse in the top viewport and the trees are there – each slightly different from the previous one. 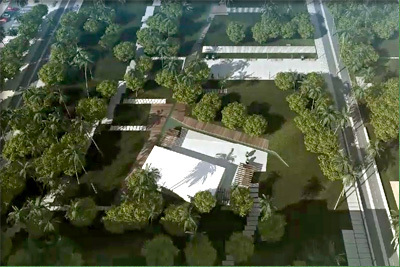 This is ideal for building tree-lined streets, tree groves, and a forest. When you put trees into Max scene with TREE STORM, the default material setting for these trees is color-per-vertex. The colors are set in OnyxTREE BROADLEAF, OnyxTREE CONIFER, OnyxPALM, or TREE CLASSIC, read by TREE STORM, and displayed as Max’s color-per-vertex materials. The colors you set in Onyx modelers will not only produce beautiful and highly realistic results, but will also save you quite a bit of rendering time. Therefore, you will not have much need to texture map trees.